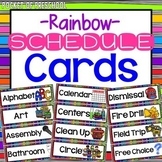 Here are some schedule cards to use for your preschool classroom. I created these for my own class when I couldn't find any that I liked. FYI: The green prints just slightly darker than how it appeared on my screen. 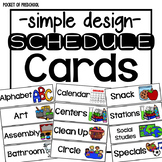 These schedule cards go along with the Frog Street Curriculum. 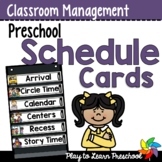 Each part of a full day pre-kindergarten has a schedule card. Just print on cardstock, laminate, and you're ready to get your schedule set up! 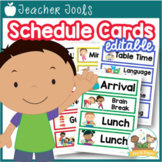 Here are some schedule cards that can be laminated and cut out for a preschool classroom. I made extra cards for centers, outside time, and snack since we do that more than once a day. 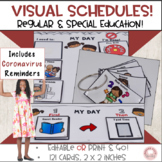 Visual Schedules and Cards, Regular and Special Ed, 2x2, Editable! 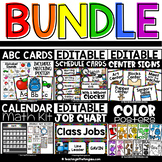 Also included in: Visual Schedules & Cards Bundle 2x2"
Here is a very colorful set of schedule cards for you to use in your classroom! 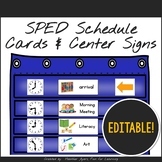 I use them in a small pocket chart near my Calendar Board, and my students refer to it often! 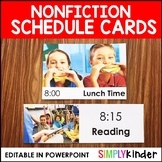 I teach Kindergarten, so these cards would be great for Preschool up to First Grade! Card Dimensions - 9.63 inches wide by 2.